A box of tissues and a friend for emotional support are necessary when watching the emotional roller coaster that is The Fault in Our Stars. 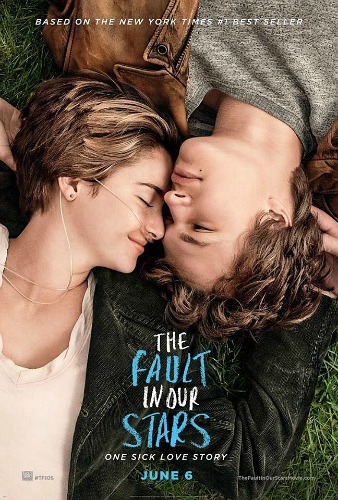 For those who loved the book, the movie version of The Fault in Out Stars is a must-see this summer. 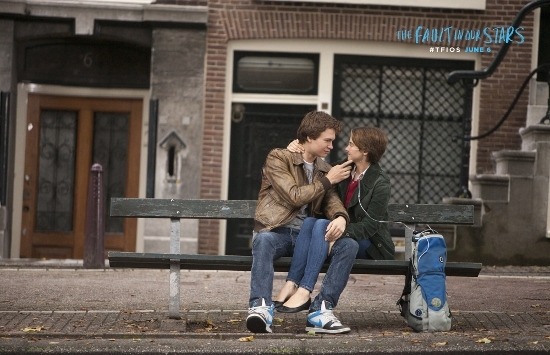 Throughout the emotional ups and downs in the film, the main character, Hazel, had a casual and comfortable style that is easy to recreate anytime of the year. Below are three looks inspired directly by the outfits Hazel wore throughout the film. 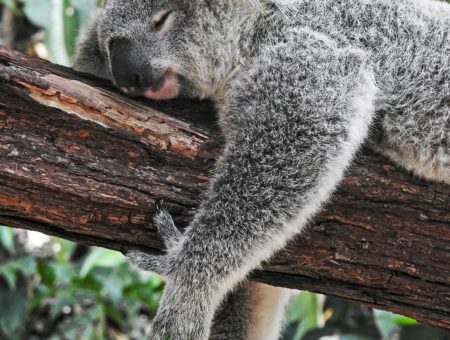 Scroll down to check them out! 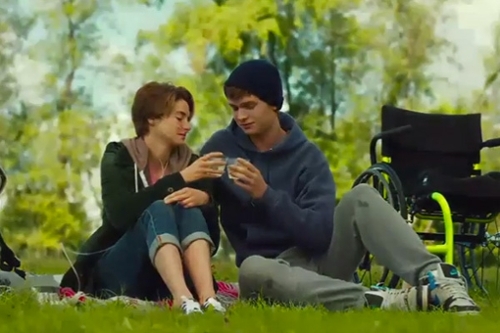 This first outfit, which Hazel wore at her and Augustus’s last picnic, perfectly reflects her causal sense of style. This look includes many layers, making it perfect for both indoor and outdoor events. In fact, we think this outfit is stylish option to wear to class or even a meeting with a study group. 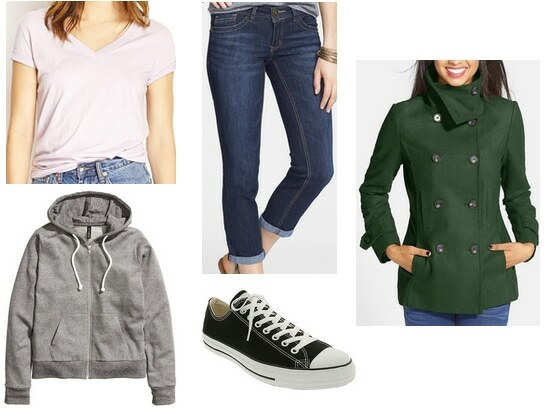 Since Hazel’s outfit is all about the layers, you can get a similar look by wearing a basic tee, then layering on a zip-up hoodie and a hunter green peacoat. The great thing about this multi-layered look is that, depending on the weather, you can add or subtract pieces as needed. In this look, Hazel also rolled up her dark wash jeans, which is another way to adjust your ensemble depending on the temperature or situation. To complete the casual outfit, add a pair of Converse or lace-up sneakers to make the look even more comfortable. When compared to other outfits Hazel wore in the film, the look above is a little more put-together. Although it includes dressier pieces, it is still a casual yet polished choice for upcoming fall classes. Like the previous ensemble, this outfit also involves many layers and can be catered to the weather. 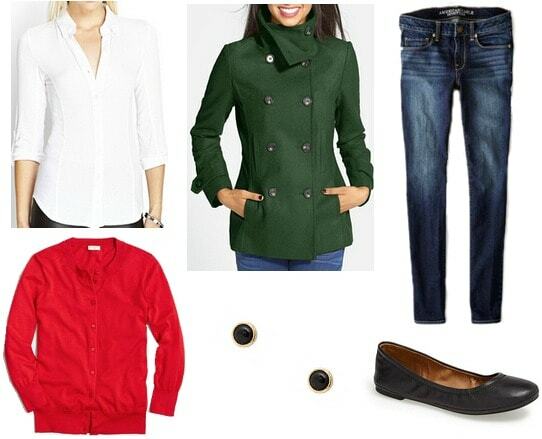 For a similar look, wear a white button-down shirt with a red cardigan or sweater. Grab that deep green peacoat for some added warmth on those cooler nights. Pair these pieces with classic blue skinny jeans and black flats for a casual vibe. As for accessories, Hazel kept it simple with a pair of black stud earrings. While in Amsterdam, Hazel branches out style-wise with a beautiful blue dress and peacoat. Although it is something that she wouldn’t normally wear every day, the outfit still suits her style, but in an elegant way that fits with the occasion. This monochrome look would be appropriate for a nice dinner with the family or that special someone. To recreate Hazel’s dinner outfit, wear a blue skater dress that isn’t too revealing. 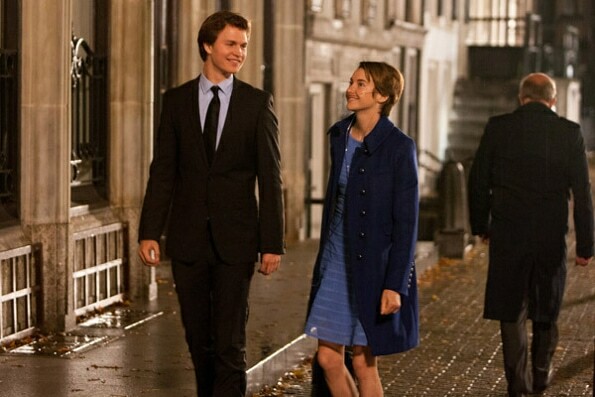 Hazel kept her clothes modest throughout the film, so choosing dress with a modest neckline and length is key. Her dress was also striped, so don’t be afraid to wear a dress that has unique detailing, like the textured frock above. 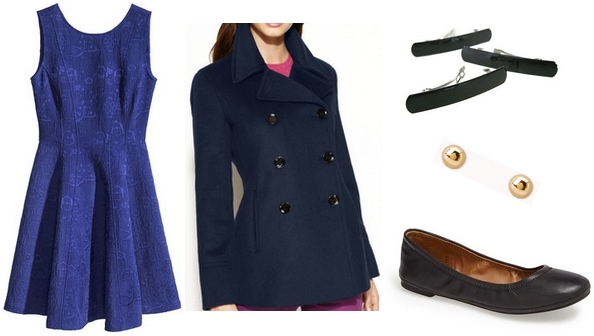 For a chic, monochrome look, wear the dress with a navy blue peacoat, then keep things comfy with classic ballet flats. Pin your hair back with a thick hair clip, then accessorize with a pair of minimalist gold studs. What do you think of these looks? Did you watch and enjoy The Fault in Our Stars? Which movies would you like to see featured in future Movie Inspiration posts? Tell us what you think in a comment below!